Colors of Bangkok Weekend Edition takes participants through a part of the Thai capital which they will never see on their own. After a quick bicycle fitting we start with our Bangkok Weekend tour. During the first part of the tour we see stand alone villas, luxurious apartment buildings, town houses and in between shops, companies and small factories. We continue our Colors of Bangkok Weekend Edition and make a stop at a sweatshop before we arrive at the pier. 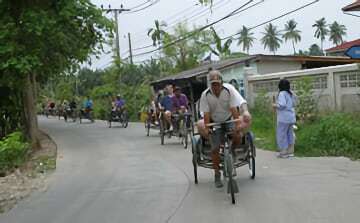 After a little while we park our bicycles and continue our trip through the greenest park of Bangkok by samlor (Thai rickshaw or ‘bicycle taxi’). The samlors stop at a authentic Thai market along the canal which is only held during the weekend. There are handicrafts for sale, but most Thai visit the market to buy and enjoy the local delicacies. We stroll around this cozy market and the guide will buy some snacks for you to taste. Halfway Colors of Bangkok Weekend Edition we stop for lunch at a local restaurant and provide a small Thai meal, Pad Thai (Thai noodles) or Khao Pad (fried rice). After lunch we visit a very old, non-touristy Buddhist temple. The guide will tell you everything about this temple and about Buddhism in general. Participants on our Colors of Bangkok Weekend Edition will learn and see how daily life passes by for Bangkokians. 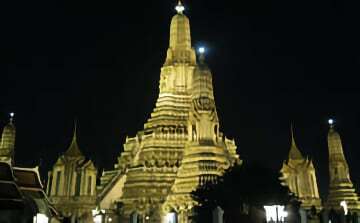 We take you off the beaten track and show you a different Bangkok, a ‘local’ Bangkok. You don’t need to be a cycling fanatic to join our Colors of Bangkok Weekend Edition. The pace is relaxed and we make enough stops for taking pictures, explanation of sights, something to drink and relax.